A trade union official has been instructed to cease all social media activity for the moment, after he referred to “rootless cosmopolitans” in a tweet. Fire Brigades Union official Paul Embery will be meeting with the union’s executive council to discuss his social media activity, but a date has not been confirmed yet. A spokesperson for the Fire Brigades Union said: “Racism in all its forms weakens and undermines trade unionism. The FBU has a longstanding history of standing up to and challenging racism. “These traditions are not reflected in the recent comments made by someone who is an official of the FBU, whether this was done knowingly or not. “We sincerely regret the use of this phrase (“rootless, cosmopolitan”) by an FBU official, and have requested that the person in question ceases all activity on social media until our executive council is able to meet to discuss. The tweet was part of an exchange of messages with other users following a tweet by sports broadcaster Gary Lineker questioning support for ending freedom of movement. 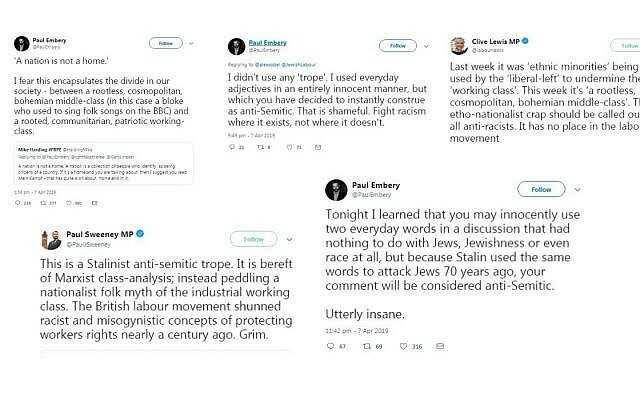 Prominent public figures, including several MPs, the Guardian journalist Dawn Foster, Novara Media’s senior editor Ash Sarkar, quickly condemned the tweet. 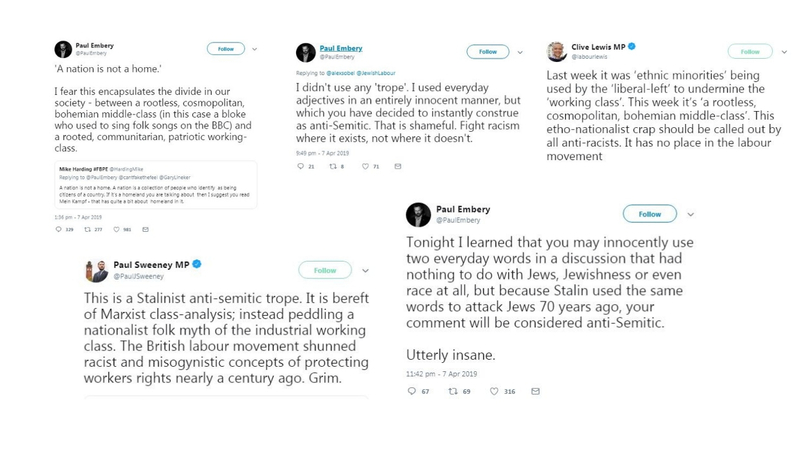 Glasgow North East MP Paul Sweeney added: “This is a Stalinist antisemitic trope. It is bereft of Marxist class-analysis; instead peddling a nationalist folk myth of the industrial working class. Embery told Jewish News: “My remarks were directed at a section of Britain’s middle-class liberals and were made during a discussion that had absolutely nothing to do with Jews, Jewishness or race in general. How some can construe this as antisemitism is beyond me. “The fact that Stalin might have used similar words in a derogatory way a century ago does not mean that everyone who ever uses those words in the future intends them to be heard in the same way. Normal people are not obsessed with communist history in that way. “It’s a shining example of how Twitter sometimes goes all hysterical and is desperate to take offence at innocent comments.